Junior League of Mobile will host Laura Bush, First Lady of the United States (2001-2009) at our inaugural Community Luncheon at the Mobile Convention Center on March 14th, 2019 at 11:30 a.m.
One of the most beloved and admired American First Ladies, for decades Laura Bush has championed key issues in the fields of education, health care, and human rights. She has traveled to more than seventy-six countries, including two historic solo trips to Afghanistan, and has launched groundbreaking education and healthcare programs in the U.S. and abroad. The author of the bestselling memoir, Spoken From The Heart, and bestselling children’s book, Our Great Big Backyard, Mrs. Bush also founded both the Texas Book Festival and the National Book Festival in Washington D.C. Today, as the Chair of the Woman’s Initiative at the George W. Bush Institute, Mrs. Bush continues her work on global healthcare innovations, empowering women in emerging democracies, education reform, and supporting the men and women who have served in America’s military. 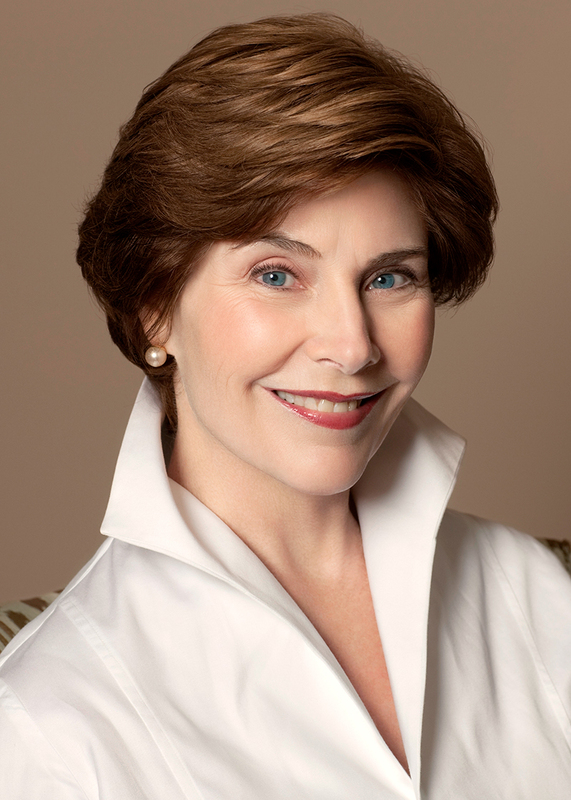 Born in Midland, Texas to Jenna and Harold Welch, Laura Bush holds a degree in education and a master’s degree in library science. She taught in public schools in Dallas, Houston, and Austin, and worked as a public school librarian. In 1977, she married George W. Bush. President and Mrs. Bush are the parents of twin daughters: Barbara, married to Craig Coyne, and Jenna, married to Henry Hager. The Bushes also are the proud grandparents of Margaret Laura “Mila” and Poppy Louise Hager. The Bush family also includes two cats, Bob and Bernadette, as well as Freddy the dog. Since 1931, the Junior League of Mobile has had a tradition of improving the lives of women and children in the Mobile and Baldwin County communities. All proceeds enable Junior League of Mobile to fulfill our mission of promoting voluntarism, developing the potential of women, and improving communities through the effective action and leadership of trained volunteers. Junior League of Mobile is proud to bring this exceptional speaker to the Gulf Coast community to share her insight and knowledge with attendees. Corporate and individual sponsorships are available. Tables are limited and available to purchase online. Individual tickets are not available at this time. You can also contact headquarters@juniorleaguemobile.org or call 251.471.3348 for additional information. Update February 7, 2019: Tables for our Community Luncheon are now extremely limited. To check availability or for more information about our events, contact headquarters@juniorleaguemobile.org or call 251.471.3348 during our business hours. Our headquarters is open Monday – Thursday 9am to 4pm and Friday 9am to 1pm.